England wicketkeeper Jonny Bairstow says he is disappointed he will not get to play with Kevin Pietersen again. Pietersen was discarded after the 5-0 Ashes defeat in Australia and England managing director Paul Downton says there is no chance he will be recalled. The ECB unveiled Peter Moores as their new coach last week with Downton saying the batsman had become "disengaged" during the doomed Ashes tour. 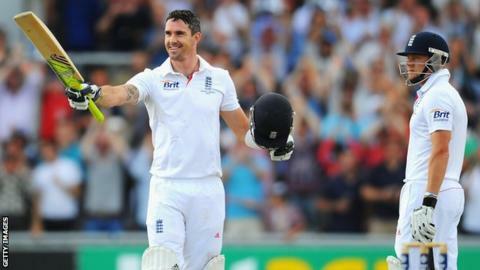 "He [Pietersen] is a fantastic player," Bairstow told BBC Radio 5 live. "He is one of the best there has ever been; it was a great pleasure to play with him. He could change a game on his own, so it's disappointing that I won't get to play with him again. "However, that is the decision they [England and Wales Cricket Board] have made and we move forward and I'm sure the team will go from strength to strength." Bairstow is currently recovering from a broken finger having replaced wicketkeeper Matt Prior for the fourth and fifth Tests during last winter's Ashes tour. The 24-year-old took 10 catches in total, but struggled for runs, scoring 10 and 21 in the fourth Test and following up with 18 and a duck in the next. He admitted the whole tour had been a "really, really tough trip" for the entire squad and not just Pietersen, adding it "was not a pleasant experience to go through". However, he believes the appointment of Moores - who returns for a second stint as coach - should herald an exciting new era for English cricket. "There will be a period of change," Bairstow said. "There will be a transition period of players coming in and out but it's an exciting time for English cricket. "That is a fresh challenge and you want to try and impress and go from there."